EatPass loyalty app is here! New startup and Eat.fi take stamp cards to a new level. EatPass is a mobile application, developed by a startup company Restarant Oy, which combines the stamp cards and benefits of restaurants to one place while also making communication between customer and restaurateur easier. The City Family member startup from Turku, Finland is collaborating with City Digital, globally fast growing company, which includes companies such as Eat.fi website, City magazine and TableOnline, an online table reservation service. The app, piloted with the name RestarantCard, is charging to markets together with refreshed Eat.fi web site. 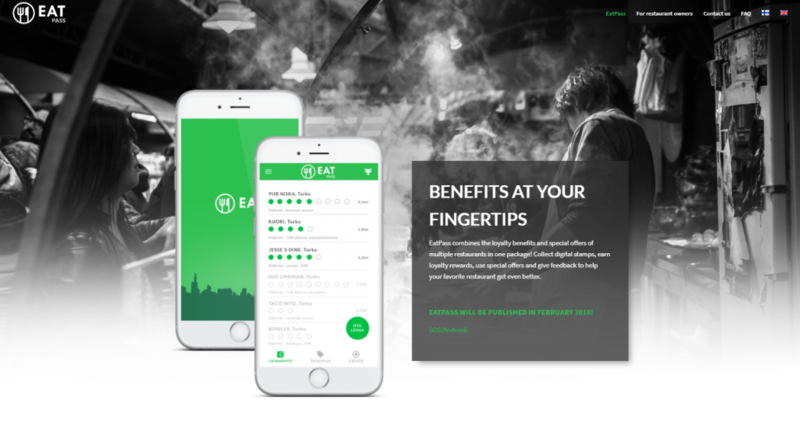 Reviews done through the app which is launching at the beginning of the year will end up to the EatAndTheCity powered websites like eat.fi in the future. – The fact that we got a partner like City Digital to join our new startup, is, of course, firm proof that our concept has a lot of potentials. There is plenty of work to do in the restaurant field to commit customers and to utilize customer data. This is where we come in with new tools and City Digital is an ideal partner for us, because they have strong experience operating in the restaurant field, explains the CEO of Restarant Oy Juha Oja. The benefits of the partnership are mutual. The reviews coming through the EatPass app will improve the reliability of the review data on the Eat.fi service. The pilot version of EatPass, named RestarantCard, has been tested by Android and iPhone users in just over ten restaurants in Turku for the last six months. The app has been constantly developed utilizing the feedback gathered from customers and end users. Bit by bit everything is coming together for the launch of EatPass. – This is a whole new level of stamp cards. You can now throw away the unpractical cardboard stamp cards. EatPass is always with you and the collected stamps and earned benefits won’t mystically disappear anymore. EatPass is a loyal customer card to the restaurant world, says Oja. Restaurant and the customer together in the same boat. The purpose of the EatPass app is to offer benefits to both the customer and the restaurateur. Customer will get loyal customer benefits, special offers and easily accessible feedback channel. The restaurateur will benefit from efficient marketing channel and customer feedback that is easy to analyze. – Our goal is to develop the restaurant culture. Offers and benefits draw people, but through our app, there is more information to obtain from the relationship between the customer and the restaurant. What and why people are eating out? What kind of things besides the food are important to customers? How can we utilize customers even more efficient in testing new innovations and developing operations? These are some of the questions we are aiming to solve, explains Oja. At the beginning restaurants using EatPass app will be found mainly in the Turku region. Going forward the aim is to spread to other big cities in Finland such as Helsinki and Tampere. EatPass will be available to download early this year for both Android and iOS. City Family is growth network of awesome forward-looking people and companies who want to reinvent better future. City Family invests and accelerates companies with smart city technologies in fields of smart restaurants, smart media, smart platforms, smart apps, smart e-commerce and smart ecosystems.